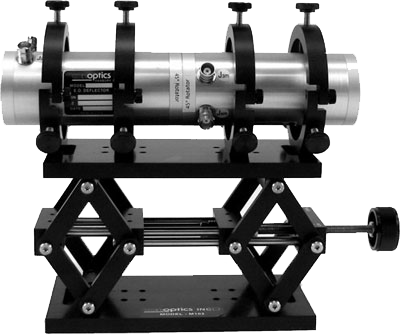 Conoptics’ series of electro-optic deflectors are the most efficient mechanisms for changing the angle of a laser beam. 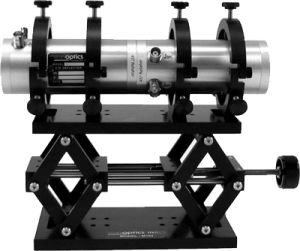 Conoptics can scan a laser beam over a range of angles, or control the output angle of a laser beam with great accuracy. 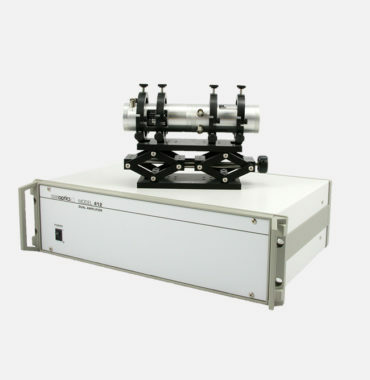 We employ a quadrapole electric field in an electro-optic material to produce a linear refractive index gradient proportional to the applied signal voltage. The angular deflection of our E-O Deflectors is small but has rapid random access response and is extremely precise. Unlike acousto-optic deflectors, the intrinsic random access response of an electro-optic deflector is the optical rather than acoustic transit time. In practice, however, E-O Deflectors appear as capacitive loads and the response is driver limited. 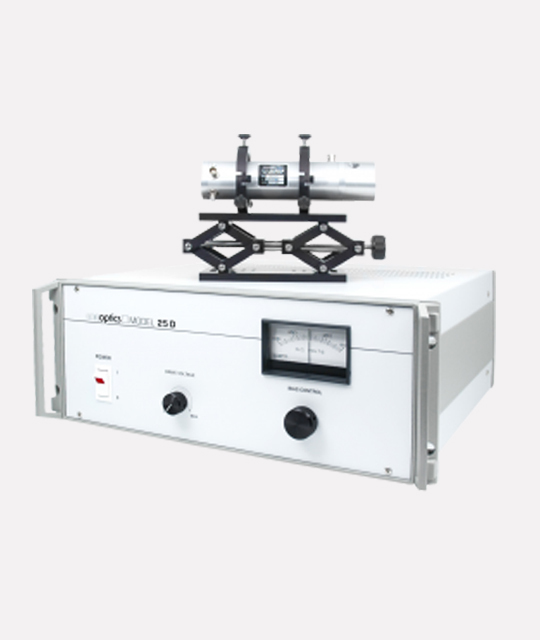 The precision with which a laser beam can be located, for all intents and purposes, is equivalent to the precision with which a voltage level can be applied to the device. Since operation is based on an index gradient, variations due to ambient temperature changes are reduced to second order effects. Similarly, unlike acousto-optic deflectors in which the deflection angle is proportional to the optical wavelength, the deflection angle of an electo-optic deflector is a function of the index dispersion and is relatively constant over the wavelength range of operation. 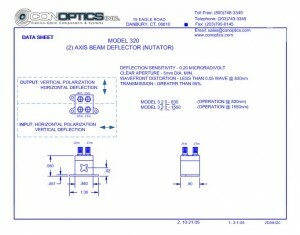 Other advantages of an E-O Deflector over an acousto-optic device include the fact that the entire beam is deflected. The transmission efficiency is limited only by the Fresnel reflections, absorption, and scattering losses in the cell and is not a function of the deflection mechanism. Furthermore, E-O Deflectors are “straight through” devices, that is, the beam is deflected about the un-deflected zero applied signal position. This is in contrast to acousto-optic devices which have a large angular offset to the center of the deflection range and require that RF be maintained on the cell when the beam is in the quiescent position. Where a diffraction limited Gaussian beam of a diameter “a” and wavelength “i” of is assumed and beam clipping losses are ignored. 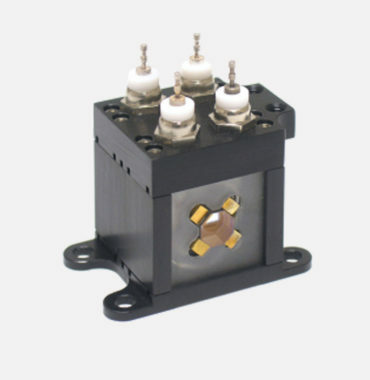 Since V/a is limited by the internal breakdown voltage (approx.1000v/mm for fluid filled units), once an electro-optic material and operating wavelength have been chosen, the active length is the only parameter remaining to increase the number of resolvable spots. Note that the equation given above is highly idealized and that “V” and “a” deserve considerable consideration because they determine the difficulty of electronics design and crystal fabrication. 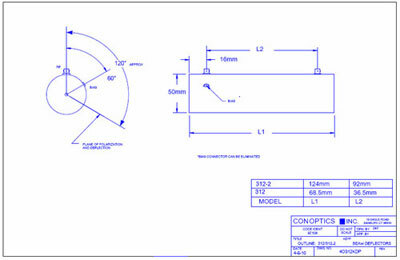 Conoptics offers several standard electronics drivers which may be use with our E-O Deflectors. Many operational requirements, however, are more easily satisfied by modifications and special versions of the 310A and drivers. 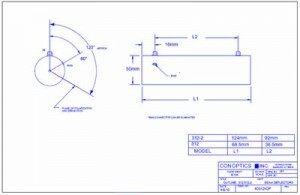 The most common changes are larger aperture diameters, operation in the UV and IR, and higher output voltage drivers with special waveforms. Construction of X-Y systems by coupling two deflectors with an intermediate polarization rotator is also common. Addition of a sensor and feedback loop driver allows the construction of a beam pointing stabilizer. 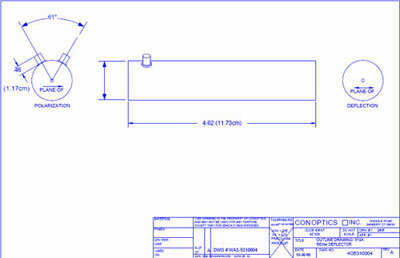 Input Power (AC) 60W typical. Input power is both load (modulator) and frequency dependent.